If the Dialog "Create a new Plan" does not appear: Don't worry, you can still follow the next steps. You can also re-enable the dialog in "Extras - Options" for the next start. If selected in the dialog window "Create a new Plan", the module selection dialog "Select Modules..." opens. Otherwise you can press ⌘M to open it. Select the desired track systems. It is possible to filter by manufacturer or track size/gauge. Hint: If you regularly use the same track systems, you can define them as preferred in "Extras - Options". 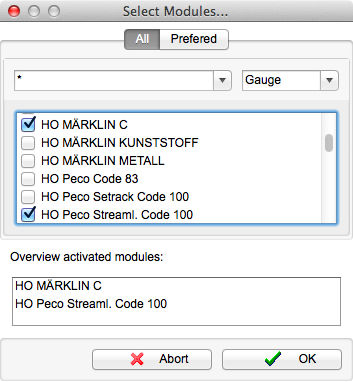 Preferred modules are shown in their own tab in the module selection dialog window. If selected in the dialog window "Create a new Plan", the dialog window "Define Available Space". Otherwise you can open the dialog window via the menu "Insert - Table - Assistant...". 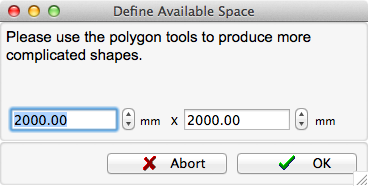 Define the bounding rectangle for your track layout (you can always change this using the drawing tools). Confirm with OK. This inserts the first visible element of the plan. At this point, your plan window should look about like this (Depending on the defined available space and the selected modules). Drag the element from the selection list. Hint: If you are using a multi-key-mouse, you can change the connector on of the new element with the right mouse button. A adds a new track element. S changes the new selected connector of the new element. 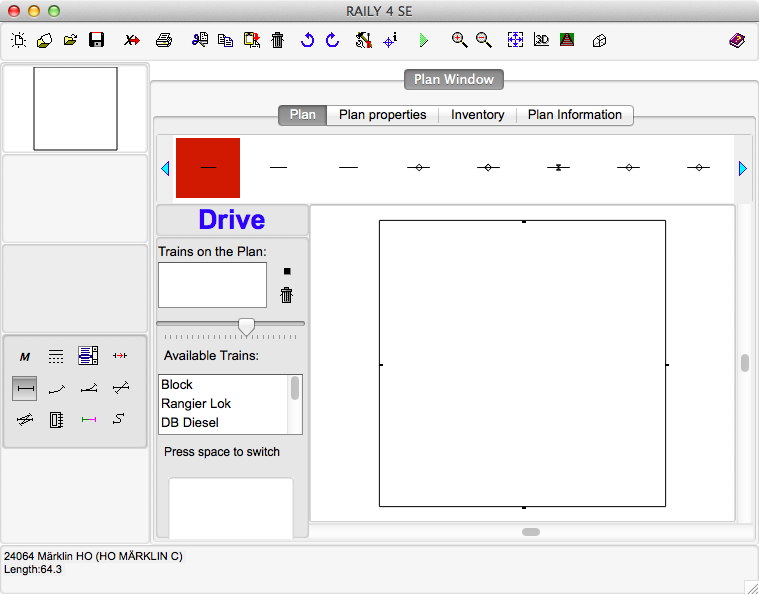 If track elements on the plan are currently selected, the new track element will be added to a free connector of the selected existing elements. The A key toggles betwenn the free connectors. Q and W Switch the element type within the current category. Clicking Add an element () adds the selected element. If no existing element is selected, you can place the track element with the mouse or the track-pad. The key S selects the connector of the new element (Hint: the same can be done with the right mouse button, if available). If an existing track element is selected, the new element will be connected to a free connector of the existing element. The key A choses the connector on the existing element (Hint: the same can be done with the middle mouse button, if available). The key S selects the connector of the new element (Hint: the same can be done with the right mouse button, if available).